Eleven Northbrookers and one supporter made the trek north to Loughborough to represent our sunburst. We managed to field 2 complete teams, almost half of us suffering knocks or niggles as a very long XC season is starting to take its effect, on a very sticky and hilly course. In cold weather conditions varying from sunshine to driving hail and rain we gave the best we could. The ladies went first and, with only 30 minutes before the men started, our solitary supporter did her best to get out and cheer them on. The men of course were still sheltering in the gazebo at this point, more worried about our hair and the cold. When we did start the ladies must have wondered what was heading towards them as close to 400 men cleared the brow of the first hill and headed down onto the course with them. Our ladies were safely through and soon finished, then retired to the relative warmth of the gazebo to recover. Then the weather turned for the worse, the ominous dark cloud got darker, and the rain and the hail stung as the climbs kept coming. Could it get any worse? What we were told was a 12km race seemed to go on considerably longer. The commentator was confused as to where the men had got to, we were confused as 12km rolled past and then they sent us round again!!! Rory led us home dragging the rest of us with him. Our last man in seemed to suffer at the hands of the course measurement/marshalling mistake as he found himself in the sprint with the winners to the finish line. Being an honest Northbrooker, Phil turned round and went out to do the last lap again ensuring his distance was substantially further than that of the rest of us. This is a 12km road race starting at Tiddington and running up Loxley Hill before plummeting down through the village and back towards the start. Birmingham League Race 3 was held at Lillishall National Sports Centre at Telford. Conditions were dry and cold for the race but underfoot the ground was spongy, slippy, undulating and ankle deep in places. With this race being the furthest away for us this season, I was hoping for a good turn out, and the guys surpassed my expectations. 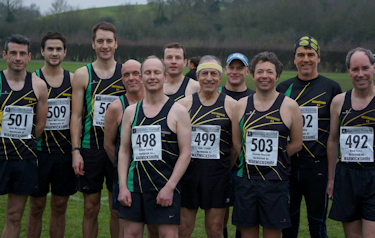 Twenty-two runners and one supporter (Chairman Bob) made the journey to a windswept field. We were faced with 4 laps but we were more than ready for the task ahead. With 7 of our guys in the top 100 (staggering performance) and a very loud and encouraging Bob we all had competition right through the field. Our top 6 are getting faster and they know there are others who want those coveted places. The top three ‘A’ teams in the division get promoted, the bottom three ‘A’ teams are relegated. Eight Northbrookers headed over for the 3rd race in the Centurion Grand Prix series. Four finished after one of us suffered a tumble on the course and one found the return on the road to recovery a little premature. 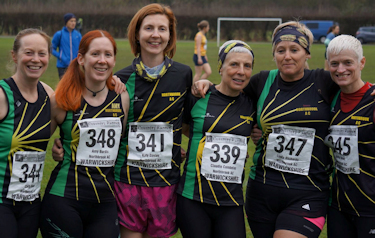 Three of us had raced in the Warwickshire cross-country champs the day before and I for one suffered on tired legs. The race was short on numbers so runners soon became spread out allowing us all to have our own battles out on the course. This event was a full program for all age categories for qualifiers for the Worcestershire and Warwickshire counties. As a result the course was fairly well churned up in places even before we started. With the weather being warm and dry for the time of the year the women went first, they all made “the ditch” and “the hill” look easy. Fantastic runs by all the women on a tough course giving us an 8th place team result. The men were second off and with a good turn-out and buoyed by “the ditch” 3 times and ascending “the hill” 3 times, we all made a tough course look easier than it was. Fantastic runs by everyone right through the field. The men came 9th out of 15, a great result. Bring on the next league race. A big thank you has to be made to the number of supporters who came out to ensure we did not drop off the pace at any point in the race.